Frozen fish sticks have been around a long time. They are a quick dinner solution, as well as a way to get your kids to eat fish. But many versions are heavy on sodium and preservatives, and often the ratio of breading to fish is not in our favor. Luckily, making your own fish sticks—or, in this case, nuggets—is easy, especially if you use a pre-made dry pancake mix. When seasoned breadcrumbs are added, you get a nice coating that crisps up when pan-fried in a little bit of oil. The lemon pepper and garlic salt add just the right amount of flavor. Heat the oil (it should come up to about 1/2 inch) in a large deep skillet over medium heat to 350 F to 365 F.
Cut fish into bite-sized pieces. Lightly sprinkle the pieces with lemon pepper and garlic salt. Place the beaten egg and water in a bowl. Combine the pancake mix and breadcrumbs in a large plastic food storage bag. Dip the fish in the egg and water mixture and then place in the bag to coat with the crumbs. Fry the coated fish pieces in the hot oil for 7 to 8 minutes, or until golden brown, turning once. Drain well on paper towels. Serve fried fish nuggets immediately with cocktail sauce or tartar sauce. Choosing the right fish is crucial to making this recipe work. The best fish for frying is a firm, meaty, white-fleshed fish; do not use a delicate fillet or else it will simply fall apart in the oil. Varieties to look for are Alaskan cod, tilapia, halibut, hake, or catfish. No matter which type of fish you choose, make sure it looks and smells fresh. If the fish is frozen, you may want to slice it into nugget-sized pieces before it is thawed; the fish will be easier to cut when the flesh is very firm. 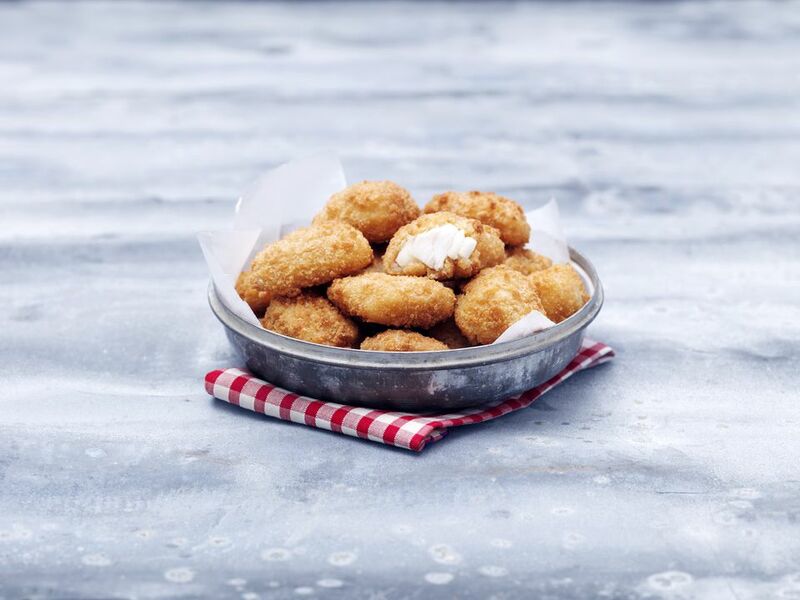 To make these nuggets into a complete meal, serve with french fries and coleslaw or carrot and celery sticks. For a healthier recipe, use organic, whole grain, or whole wheat pancake mix. Many of these variations not only offer more fiber but are also usually low in sugar, calories, and sodium. If you'd rather not use boxed pancake mix, you can easily make your own. A simple dry pancake mix includes flour, baking powder, cream of tartar, powdered milk and shortening. For an even healthier version, try a mixture of oats, 4 different flours, buttermilk powder, and malt powder. To change up the texture and flavor of these fish nuggets, substitute cornmeal for the breadcrumbs and swap out the lemon pepper and garlic salt for Old Bay seasoning. If you like this recipe but are looking for something with a little more kick, beer batter fried fish nuggets have a bit of hot sauce and cayenne pepper, making these crispy pieces perfect for fish tacos.